I don't know how others feel about Spam, but Spam wrapped up in a tortilla is one of the foods I enjoy most when I am backpacking. The calories for the weight are pretty good and I never get tired of eating it (I'm pretty easy to please). I bring the single slice servings and can usually pick them up for about a $1.00 each, so it really makes for a low cost meal. With a focus to really drive down the weight of my pack I also don't bring a stove on to many trips, so Spam works well for me and if I do have a stove you can add Spam to just about anything to make it that much better. Anyone else a closet Spam lover? 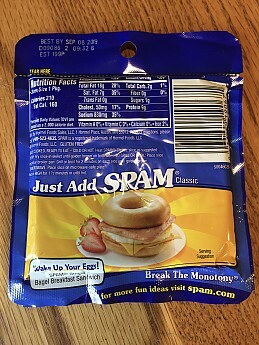 I eat the original Spam. Never had the single pack. I used to regularly carry that but over the last few years high-sodium things like spam have given me a lot of heartburn. Now I have no good reason to sing the spam song from Monty Python anymore while on the trail! I don't carry it, but I can imagine how happy things get when you are soaking up that good fat. The last couple of years I've made a concerted effort to shift towards fat fueling and as long as you don't ruin it by getting some low fat version, SPAM would rock on trail. Seems a bit messy to me though which is why I'm not gonna carry it. What I have been using is an uncured sopressata dry salami which goes great in a tortilla with full milk fat cheese sticks. 2 oz of sausage is 200 calories with 160 coming from fat. Cheese stick adds 90 calories with 70 coming from fat. Tortillas are naturally a bit more carb heavy, 190 calories with only 45 from fat. One of those goes about 500 calories and I'll often do one for elevensies and another mid afternoon though eating both in one sitting over a long lunch break is always an option. I pack one sausage for every two days and am much happier at the end of the day compared to when I used to eat carbs all day long. When you are working hard, fat is your friend. This is especially true in cold wet weather. I remember reading a story written my an old horse packer. They had a 25 mile uphill slog through the rain and sleet in the Cascades. The guy was very poetic about a dinner of Spam and eggs and how much better he felt after eating it. I would try a single serving in a pouch. Great idea. Phil- heartburn is a good sign of GERD and that can lead to something quite harmful. Been there done that and I was close to going past the point of no return. Ever have a 'scope'? I prefer what I call 'hard' or 'dry' Margherita Pepperoni stick. It also comes in a 'soft'. 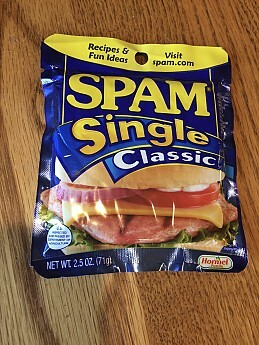 I throw the spam single serve in on occasion. I'm a fan of all the foil packed meats, tuna, salmon, chicken etc. Is that the five minute version or the ten minute version? I reached a point of saturation back in my youth. I am spammed out. But am ok with other canned/packaged meats. Tuna packed in oil, always good. Plus mayo, more good. I bring peanut butter - very dense on calories. I also bring olive oil, finding its way into all sorts of items. Some venues have me passing great road stands selling fresh local jerky, another dense calorie provision. Old Guide...have heard of GERD and been tested but it seems my reaction is to msg (and it's derivatives) and/or high sodium food. Not terrible but enough to make me avoid them. I choose my foods carefully now but miss the easy stuff like a slice of spam. Thanks for the videos guys. Haven't watched that one in a while...grew up on MP and Benny Hill in Britain in the 70s...if you knew me it would explain a lot! Can't forget the pepperoni! I miss the old Kraft "squeeze cheese". Like Cheese whiz in a plastic bag. A bagel, peanut butter, pepperoni or summer sausage topped with imitation cheese was my go to trail lunch for years. I like it and it comes in many flavors too where you can find them! I haven't seen it in the plastic in years. I stI'll see it in some stores...more in the stores near trailheads than those in the city. Hawaii has the best selection of flavors...some I have never heard of before. It was nice to hear what other's bring for fat and protein instead of my favorite Spam and I'll have to check those options out. Goose, thanks for including the Monty Python Spam video as it is a classic and you can never get too much Monty Python! I occasionally buy the single slices for one reason only—I sometimes get a craving for Spam musubi, the famous Hawaiian preparation. We hike with plain old cheese and salami, which were originally invented, before the invention of refrigeration, as ways to preserve milk and meat. They get sort of oily in hot weather, so your ziplock needs to not leak, but otherwise they keep just fine for a week, which is about as long as we go between grocery stores, and there is a lot of variety of flavors to choose from, and not much packaging to carry out. We also use butter, transferred into a plastic peanut butter jar. It goes on rice or pasta or bread. Olive oil could do the same. And there is always peanut butter and nutella! I have carried the package foil packs too, and they some in so many flavors. Usually tho I carry the cans within a Ziploc bag. And slice it as needed. Scrambled eggs and chopped Spam is great.